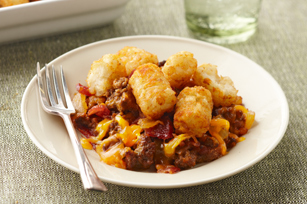 As good as it sounds—a bacon cheeseburger in easy casserole form! Instead of fries on the side, you get golden brown potato nuggets on top. Bake 30 to 35 min. or until casserole is heated through and potatoes are golden brown.